4 Sessions over 8 Weeks, part of FAStTRAC, and led by Key Yessaad. The sessions will focus on The Fundamentals of Internet Marketing, Web Services, SEO, Internet Traffic, Social Media, Real Estate Websites, Blogging, and the Habits of Internet Prospecting. 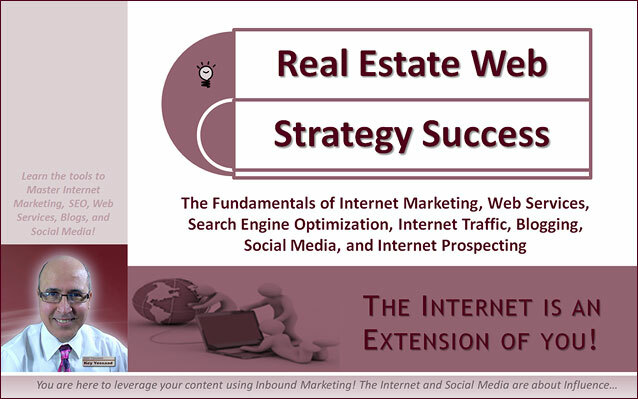 Real Estate Web Strategy Success focuses on the fundamentals of Internet Marketing, Web Strategies, Google Presence, and how to use your website to generate leads organically. The core of Search Engine Optimization (SEO), or Organic Placement, are now the bedrock of your growing Marketing Success Story. This course was designed to be practical, solutions-driven, and full of practical Homework. This is not about theory – this is about meeting your clients online and being able to generate your own leads organically – and the best ones are Listing Leads. Do you have a proper Internet Presence? And ‘No,’ Marketing on The Internet is not ‘Internet Marketing!’ Real Estate Agents advertise to drive customers to them, and many still do – but it is getting harder. What is it that you must master in “Search Marketing” so you continue to be the one Sellers and Buyers love to work with. You must go beyond understanding the psychology of your customers – you must also become familiar with the thinking of Search Engines and Ranking. It is this lack of deep understanding of the internet that makes Agents and Brokers go on a buying spree for tools with very little results to show for it. Yes, Yes,… Vendors call them Websites – I prefer the word ‘container’ because it alludes to holding your Marketing information and making it available to your customers. What’s the challenge? If your container is not visible to Google and Search Engines then what you have is purely a Glorified Internet Business Card. You must learn not only what your Website must have to grow organically, but more importantly the habits you must develop Online to grow you influence and generate leads. Prospecting is job One for a successful career in Real Estate – Do you know how to “Internet Prospect?” A successful SEO Strategy requires a combination of ingredients; a Web Container, Blogging, Keywords, Hyperlinks, Strategic landing Pages, and a Plan of Action in which you tell regular stories and place them on the Internet to drive traffic back to your website. This is not a difficult skill, it just requires you to switch your habits a bit and focus them in the right actions for the right results. Contact: Emma Ahearn at The Real Estate Training Institute, Inc.